There’s been a lot of heartbreak for Wisconsin over the last eight seasons. A lot of missed opportunities and seasons ended just short of the finish line. They’d won regular season championships, WCHA postseason championships, held the top spot in the national rankings, but hadn’t brought a national championship home since 2011. They lost to the Gophers in the 2012 national championship and at the Frozen Four in 2014, 2015, and 2016, fell to Clarkson in the title game in 2017, and bowed out to Colgate in double overtime last year in the semifinals. If there’s an “it” factor in sports, it might’ve seemed like the Badgers were missing it. Not this season, and not on Sunday. In the end, the Badgers were just pristine in all areas, all the way through the NCAA Tournament. They shut out all three teams they faced. They capitalized offensively and shut down opponents on the power play. 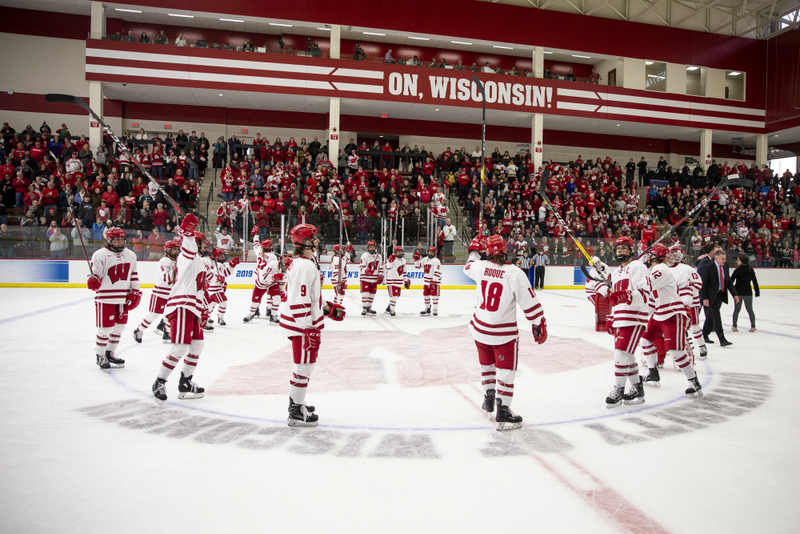 They looked very much like the best team in the country, and after a 2-0 victory over Minnesota on Sunday, they earned that title: the Badgers are the 2019 NCAA Division I national champions. As simple as this Wisconsin team made it look throughout the tournament, the Badgers went through their share of adversity this year, and there were plenty of adjustments to be made along the way. Like how at the beginning of the season, Mark Johnson asked Presley Norby and Sophia Shaver to take less of a featured role in the offense. Wisconsin returned Annie Pankowski and Emily Clark from stints with their national teams, taking up two critical spots in the top-six and on the power play. They answered those questions succinctly, teaming up to create one of the country’s best third lines with fellow forward Caitlin Schneider. On Sunday, Norby and Shaver ended up getting the Badgers on the board in the first period. After some great work along the boards by Norby, she centered a feed from the corner boards for Shaver, who buried it past Minnesota goaltender Alex Gulstene. That put Wisconsin up 1-0. Then there was the way the regular season ended. Wisconsin had spent the majority of the season in first place in the WCHA standings, and were in great position to lock up the Julianne Bye Cup, awarded to the league’s regular season champion, in their last series against Ohio State. Instead, the team tied with the Buckeyes and lost in a shootout in back-to-back games, conceding the trophy to the Gophers. After that, the team needed to regroup. And then there’s the goaltender, Kristen Campbell. Two years ago, Campbell was preparing for her sophomore season at the University of North Dakota when the program was cut. She ended up at Wisconsin, took over the starting job, and helped the Badgers earn their way to the Frozen Four, where they fell to Colgate in a 4-3 loss. Campbell, like the rest of her team, learned from that and made the adjustment. In Sunday’s championship game, she recorded her third straight shutout and became the first goaltender in history to not allow a single goal throughout the NCAA Tournament. Wisconsin’s commitment defensively to getting sticks on pucks and clearing out rebounds made it a much tougher game for Minnesota. Pankowski, a senior captain for Wisconsin, might be the very best example on the team of overcoming adversity and executing in the moment. Last season, she was cut from the U.S. Olympic Team for the second time in her career. In 2018-19, she didn’t have the most scorching regular season points-wise. But the playoffs were a totally different story. On a shorthanded breakaway in the second period, Pankowski effortlessly lifted a beautiful backhand shot over Gulstene’s shoulder for the 2-0 lead. That was her 11th goal in seven postseason games. That doubled the deficit for the Gophers, and proved to be a game-breaking goal at a critical point. Thanks largely to Pankowski’s determination and scoring touch this postseason, she’s leaving Wisconsin after bringing a national championship back to Madison for the first time since 2011. For Minnesota, it’s a heartbreaking loss for a team that was in it the entire game, pressing for goals. Frost and his Gophers squad talk a lot about how hockey isn’t the most important thing. He mentioned it after Minnesota won in the semifinals and he brought it up again after they lost to Wisconsin. And he doesn’t mean that losing doesn’t hurt; he just means that no result in hockey, a win or a loss, could ever define what’s at the heart of a team. “Don’t for one second think that we don’t want to win,” Frost said. “I hope nobody ever gets that out of what we’re talking about, of life being more important than hockey. The feeling of finally winning the national championship hit the Wisconsin players at different times. Kristen Campbell said she feels like she’s already been here before, with how many times she’s pictured that moment in her head. After the game, Pankowski said she was still waiting for it to click. But Rolfes said it started to hit her with about two minutes left on the clock.